With shooters dominating the modern video game landscape, it's hard to imagine a time where colourful platformers held such a large stake in the video game industry. Alas, platformers have been pushed aside in place of these violent brutes, but with the growing popularity of the indies, platformers may just see a resurgence in the coming years. 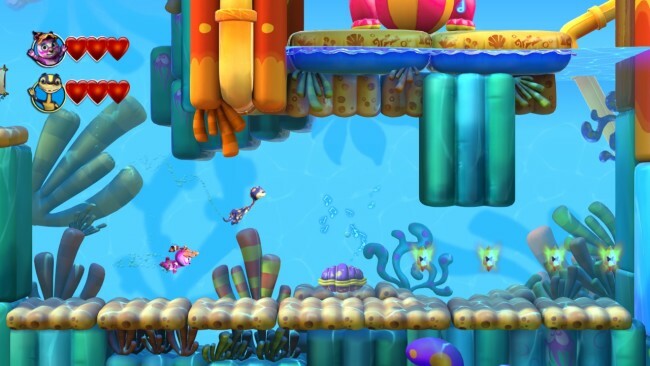 Take, for example, Juju, a cutesy platformer that seeks to provide fond childhood memories for the younger generation, just as Banjo-Kazooie, Mario and Crash Bandicoot did all those years ago. This ambition can be seen instantly thanks to Juju's adorable art style. Colour oozes from every pixel; from lush jungles brimming with wild animal life, to a delicious wonderland of ice cream, chocolate and sweet, sweet candy. These worlds are restless and energetic, constantly daring you to explore them. Great animations further add to Juju's visual appeal. The pounding of your jump slam and the resulting ripple as the level responds to this minor tremor. The movement of a defeated frog, as it spirals out of view like a deflating balloon. The combined package is a game that is very easy on the eye. To round off Juju's sublime presentation is an excellent score. Juju's soundtrack is a joy to listen to and properly reflects the upbeat nature of the game. Playful tunes throughout will get stuck in your head after a few repeats, and are one of the Juju's most memorable features. Sound effects are equally impressive, and show a shrewd attention to detail. Everything from the pitter patter of Juju's footsteps to the thud of a builder's helmet is accounted for. No stone is left unturned in the sound department. Juju's story takes the perspective of Juju, a shaman panda, and his lizard sidekick Peyo, whose playful antics accidentally set off a disastrous chain of events when Jambee's (Juju's father) back is turned. Jambee is captured and the peaceful world in which they inhabit becomes corrupted. With the help of a magical mask, the duo set off to free Jambee and restore peace to the land. Unfortunately, things begin to go downhill when you actually get to play the game. The controls are responsive and easy to learn. The ability to jump and hit are expected in this genre, but pressing the Y button (or corresponding keyboard key) will also send nearby enemies in an uncontrollable fit of dancing, allowing you to attack while their guard is down. It also triggers level progression and the appearance of hidden goodies. You will unlock additional abilities during the course of your adventure, but they fail to make any meaningful impact on gameplay. An extra annoyance came from the jump slam, which would occasionally trigger when I didn't want it to, resulting in a few unnecessary deaths. It won't take you long to get bored, however. The game as a whole is far too easy, and devoid of any real challenge. 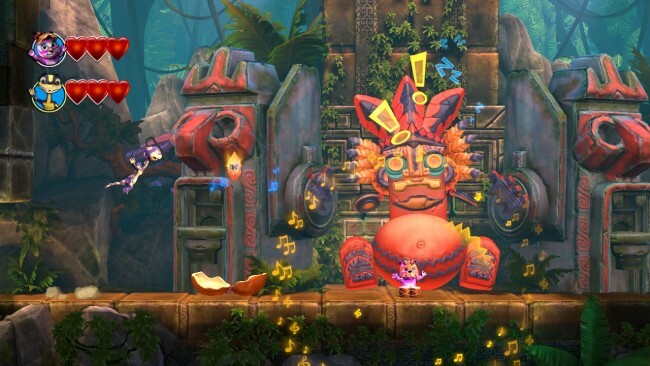 Gamers with previous platforming experience will breeze through levels with little to no effort, even in the games final levels. For those who are finding things tricky there is an easy mode, but I doubt it will be used much. After a couple of hours, I was playing with one eye closed through repetitive levels that fail to bring any original ideas to the table. Movement is slow, and those who enjoy speed running will be left frustrated by the lack of any real pace or even a running ability. The ability to play with a friend does ease this burden somewhat, but there aren't any ways that players can interact with one another, or help each other pass a level. Instead its simply a case of each player doing their own thing. Level's consist of collecting amber, defeating enemies and discovering secret areas. These secret areas are well hidden for the most part, to the game's credit, but your reasons for discovering these secrets become dwindled by the painfully repetitive bonus rounds. There are three hidden gates per level that lead to these bonus rounds, but the more you play Juju, the more you begin to question whether or not you should even bother doing them. There are only around six or seven different bonus rounds available, and over thirty levels in the game, meaning you will repeat exactly the same bonus rounds over and over. It begs the question: If there were so little variations of bonus round made, then why did they bother putting them in at all? There are four worlds in total, with eight or nine levels per world. Each world takes little over an hour to finish casually, but can be replayed to earn all the medals, beat all the time trials, and beat each levels hard mode, which gives you only a single hit to complete the level. This will keep you occupied for quite a bit, if sleep hasn't taken you yet. Juju's boss battles show rare instances of the games potential, which makes the whole experience all the more disappointing. Boss battles are fun and relatively challenging, using the familiar format of learning the bosses attacking rhythm, and attacking at the moment of opportunity. 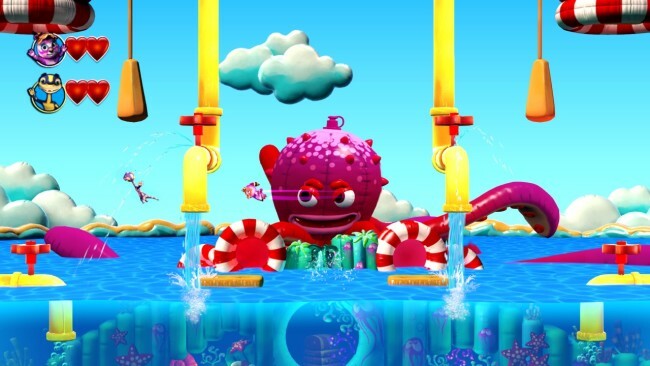 Each boss battle represents a new challenge: an octopus that can raise or lower the water level, a giant cupcake that spews out explosives that can inadvertently clear a path for you. It's a shame really, that the rest of the game isn't as engaging. Another chink in Juju's armour is the menu layout. Everything is represented with simple icons, with no descriptions as to what anything does. It looks all the better, but is nonfunctional as a result. I spent far too much time bumbling around the menu trying to figure out what everything did. For instance, two yellow hearts represent easy mode, a golden mask represents hard mode and three gems represent normal mode. It's certainly no deal breaker, but its a problem that could be solved easily. Looks aren't everything, and beneath Juju's gorgeous presentation is a damaged game that fails to draw any real interest. It's a dull romp through exquisite scenery,a perfect example of how you should not judge a book by its cover. Despite moment's of brilliance, it's hard to recommend to an audience of any age, whether it be a fifty year old gaming aficionado or a five year old infant. It's fair to say Cloud Chamber is a very specific type of game for a very specific type of gamer.